Window treatments can really finish off a room’s decor, but they can be expensive too. If you’re in the market for new window treatments, I’m going to share my thoughts on why it might be a good idea to invest your time and money into custom window treatments over store-bought draperies and valances when you’re getting ready to dress your windows. Custom window treatments are a huge part of my business. I love how they can truly finish a room. But, custom can be expensive. 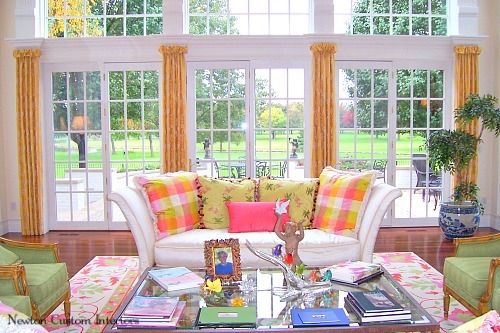 You almost need to think of custom window treatments as an investment, and plan to keep them for 5-10 years. 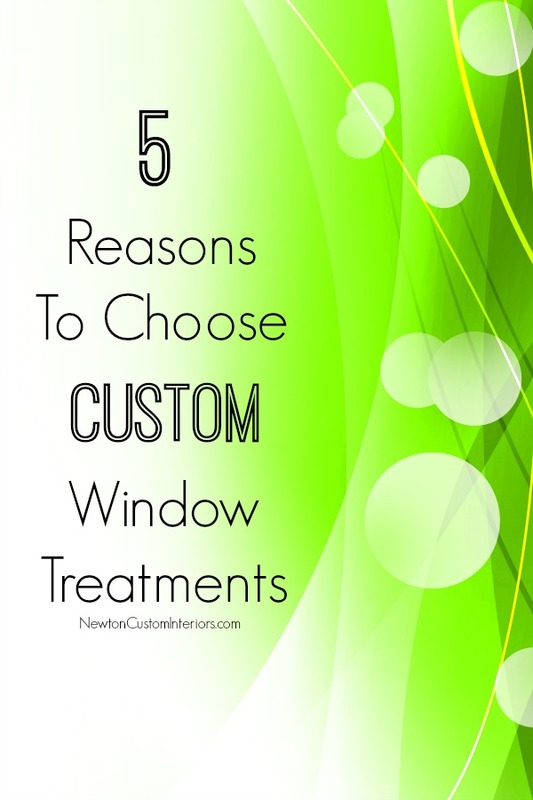 I know that’s not for everyone, but I hope to show you here some of the benefits of having custom window treatments made for your windows. 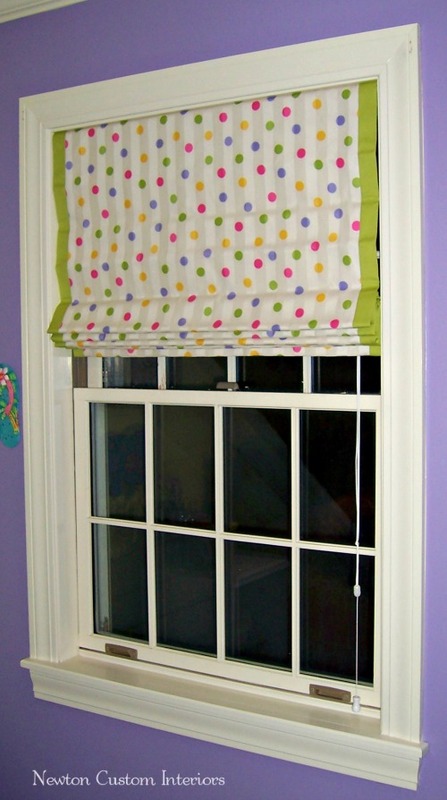 Whether you buy the fabric and sew the window treatments yourself, or have someone else make them. I do want to clarify that I’m not saying all ready-made window treatments are bad, some are very nice. 1. They will be made to fit your windows – I think this is one of the biggest differences between custom window treatments and ready-mades. They will be made to fit your windows exactly. If you have odd sized windows, you may have difficulty finding ready-made treatments that will be the correct length, width, or both. This roman shade was made to fit exactly inside the window trim. I have seen so many ready-made panels that are too short or way too long. Also, it’s nice when your panels can be made wide enough to hang outside of the glass area. How frustrating! Now this is not going to happen to everyone who buys ready-mades, but I think it’s more likely when you buy something that is mass-produced in a factory instead of by an individual who fabricates in their studio. 3. Better quality fabrics and linings- Usually custom window treatments are made out of good quality fabrics and linings, but this is not always the case with ready-mades. A few years ago, I had a client bring me 4 plaid silk drapery panels that she had bought on sale at a big name store. She wanted me to take the panels apart, and just use the fabric to make wider panels for her window. Unfortunately, the silk plaid fabric was not woven the same on each panel. Some of the panels were woven tighter than the others, so I could not match up the plaids at the seams for her. So, the end product was not very nice. 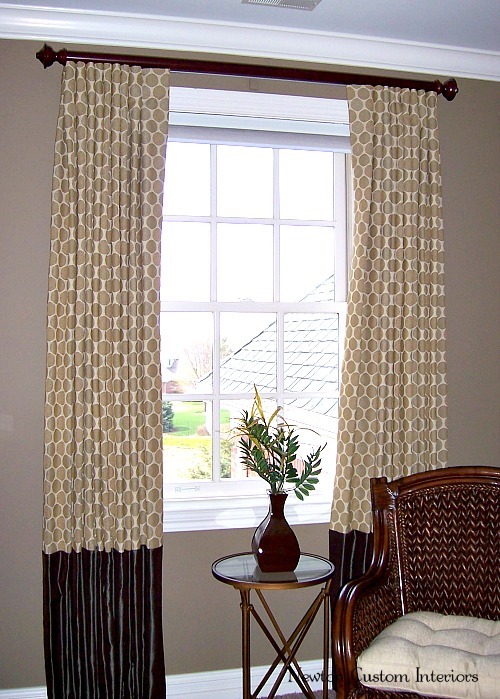 Custom window treatments are usually made from better quality fabrics and linings. This makes matching patterns at the seams easier. Also, using good quality linings can actually extend the life of the fabrics. For instance, if you’re using a silk fabric, black out lining will help keep the sun from damaging the fabric. 4. Fabrics will be chosen for your decor – Another benefit of having custom window treatments made for you, is that you can have the treatments fabricated in the fabric or fabrics of your choice, instead of being limited to a few fabric choices. This is very helpful when you’re trying to coordinate with other elements in the room, and want to pull the look of the room together. 5. 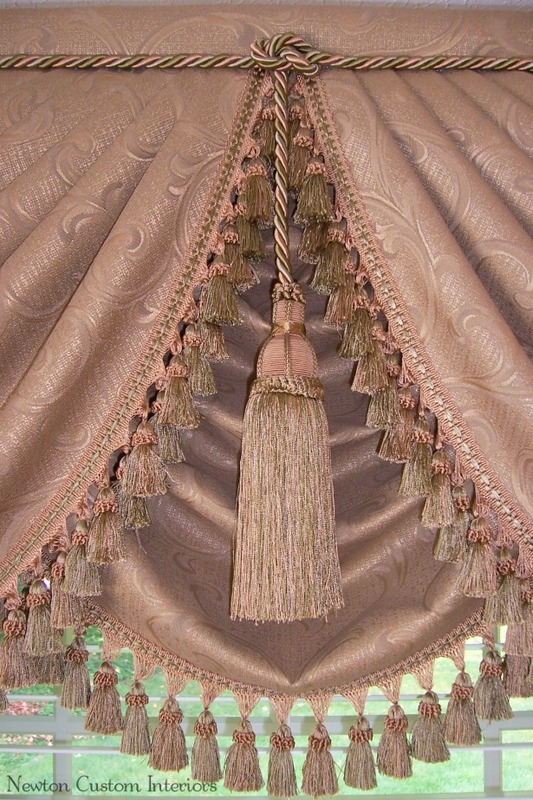 Custom details – Adding custom details, like trims, cording, knife-pleat ruffles and tassels, is one of my favorite things about custom window treatments. You can create a truly custom look that will not be like anyone elses. OK, I’ll get off my soapbox now! As you can see I’m very passionate about custom window treatments! 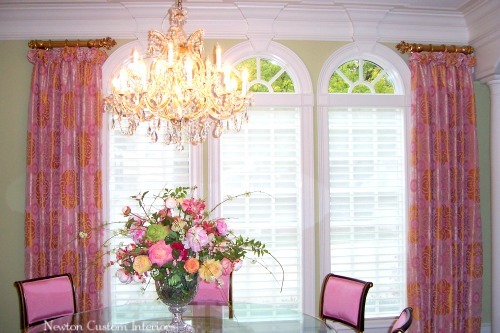 You can visit my Gallery to see more examples of custom window treatments. What do you think? Custom window treatments or ready-mades? Wow! You quoted me! Great post. Loribeth, thanks! I thought the problem you had with your panels really drove home my point about quality. The photos give a nice representation to the quality and design of your custom treatments. Like most things that are considered “expensive”, you don’t realize the value until you have them and then there is no going back to the lesser quality ready-mades. Marie, thanks! So true about the true value of them. You’ve summed it up perfectly! Naturally, I always choose custom, since I make my own. Many people don’t know how to sew, so your services are a wonderful way to offer custom treatments. Nice post!! I really love how beautiful custom window treatments are. Especially if you’ve put a ton of work into remodeling a room and getting a theme going, it’s hard to pair a generic set of curtains with intricate color/pattern schemes. My neighbor’s remodel project is going amazing and I’m helping her find some custom window treatments after the contractor finishes putting in High Efficiency windows. 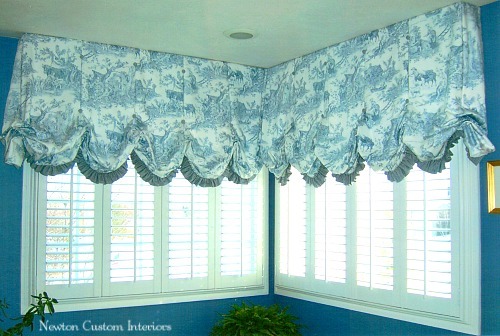 She loves the look of those blue curtains with the vintage pattern under #3. Thanks Veronika! Good luck with the project! That before and after picture at the top really says it all. The difference is night and day, we have been looking for nice drapes to compliment our dining room. These are definitely good reasons, the quality if unmatched. I totally agree with your post. I have been in some expensive homes and all the windows are bare. Custom curtains give a finished look plus I think it makes it feel so inviting. I am not an expert in sewing but it has been fun to make all the curtains and drapes for our home. Thanks Linda! I think it’s fantastic that you’ve made all of the curtains and drapes for your home!